This is a shallow river that starts just 5 miles from Lake Pend Oreille and empties into the North Fork of the Coeur d’Alene River, a 45 mile trip. It is a tributary of the North Fork of The Coeur d'Alene River. Floating/Boating the river: This off shoot of the Coeur d'alene River is not known as a good river to float due to the shallow nature of the river, and at spots there are dangerous sweepers (low hanging tree branches, logs, etc. just off the surface of the river). Bank river fishing is the primarily activity. Best place to float/boat is the North Fork of the Coeur d'Alene River via its many access points ending at the Old Mission on the Coeur d'Alene River itself (below where the south and north fork merge). Amenities: There are many locations along the river to do primitive camping and to access the water. For a more developed campground there is the Bumblebee Campground just a short distance from the river with paved camping pads, paved parking, and restrooms, and running water (click here to learn more about the campground). Fishing: There are also many places along the road and river bank to fish from, but getting the fish to bite is another thing. There are many logs, stumps, etc. 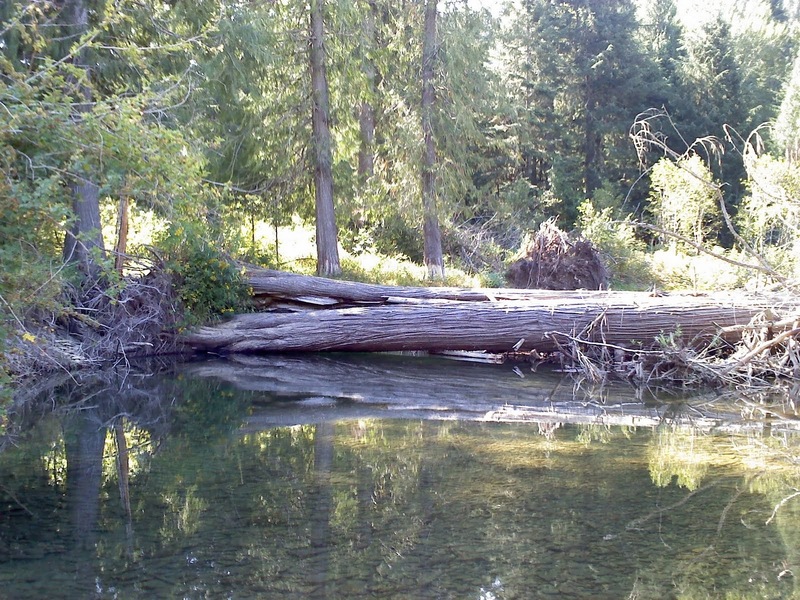 that create shade and pools that the fish like to hang out in, but these can be dangerous obstacles if you are trying to float/boat the river, especially when the current is fast (see photos below). Logs along the river shore line are common places fish like to hang out. Be Aware: there is a "no motor and glass container/bottle" usage law… they will ticket you for either. Also make sure to completely park off the road because if you do not your vehicle will get towed away. Directions: To get to the river take the Kingston exit 43 off of I-90 and head north on the Coeur d’Alene River Road. Kingston is the closest city (population 175) and Enaville (no population #'s available) is even closer but is not really a town but a spot in the road. After heading north a few miles on Coeur d'Alene River Road turn left/west onto Little North Fork Road/NF 209 that crosses the river via Bumblebee Bridge. This road runs along the Little Fork of the Coeur d’Alene River. ACCESSIBILITY: This section of the Coeur d'Alene River has no sits developed giving those using wheelchairs and other wheeled mobility devices access to the river, however with assistance one could access to the river. Caution lots of snags, sweepers, and high current pose significant dangers. PARKING... Gravel, dirt, muddy area to parking along the road and within the campground; PATHS/TRAILS... No developed paths/trails. Primitive single track trails to river; RESTROOMS/FACILITIES/SHADE… Fully accessible restroom within campground. Shade via trees; DOCKS/LAUNCHES/PLATFORMS… No. Launch from bank/beach; DIRECT WATER ACCESS… No developed access for wheeled mobility devices; TRANSFER SYSTEMS... None; SENSORY... No sensory tactile markers for those with visual and other impairments; CAMPING... Accessible Tent and RV campsites within campground, no hookups. Primitive tent and RV camping along river with no accessibility features; O.T.H.E.R… Oddities/Barriers: Sand/mud/marine vegetation; Terrain: Level to 6% grades over grass/sand/gravel/dirt/mud surfaces; H2O/Water: Water clear. Water temperature in the summer can be around 50 to 60 degrees. No Drinking water available; Environmental Conditions: Varies; Resources: Food, drinks, and gas in town of Kingston, ID. Click here to visit the Lower portion of the Coeur d'Alene River and Chain Lakes! Sportsman Access and Campsite Pictures coming soon!